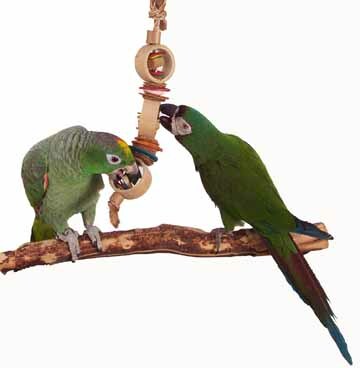 We're happy to introduce just a few of the Busy Beaks models, check back often! Ozzy, the Senegal, is the newest member of the Busy Beaks family ... and loves her Get A Grip, shredders and all kinds of love from her parront, Susan! 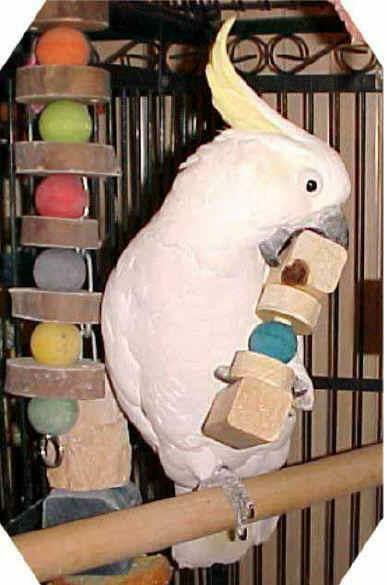 Greater Vasa, "Vasa Madda You" aka Maddie, is a great demo bird, she's very mechanically minded and loves foot toys (see her with the fortune cookie, twirler, nuts & bolts, burger face and spaghetti ball)! A very BUSY BEAK indeed! What a Lucky Bird! 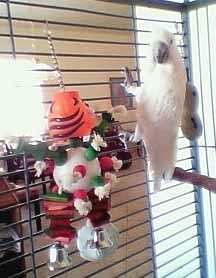 Boomer has his very own tree as a play stand and he's playing with a bullet proof bell. Thanks for sharing Lesly & Tom! BFA and Hahn's macaw live in Taiwan with a very creative "parront!" He has found new ways to use the curl and bungee for more playtime fun! Lutino Cockatiel Sunny is really enjoying her new companion, Happy Girl! Peach face lovebird, Oliver, LOVES his cotton wreath and snuggle ring for sleeping, playing and hanging out. The kokocorn cruncher is enjoyed too! This young CAG also lives in Taiwan with the BFA and Hahn's pictured left! 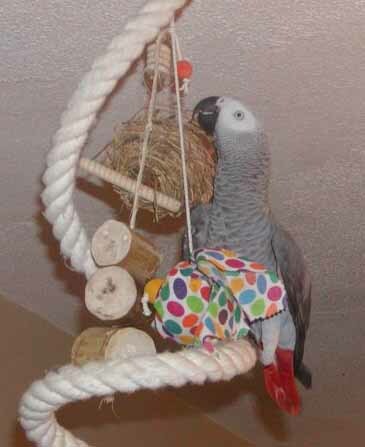 The munch ball is a great toy for youngsters to shred! 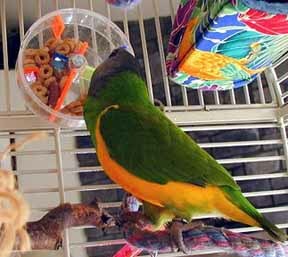 Riley is a very active Busy Beak who loves kabobs! What a beauty! Thanks for sharing Michelle! Buzz, CAG, just LOVES acrylic toys and has managed to learn how to TAKE ME APART and investigates Mr. C! Ruby is enjoying her lovely garden in Japan! She especially loves the musical toys! Milo, Galah, is enjoying his first Sock-It! What a cutie!! Choon Choon, Brown Throat Conure had been a chronic egg layer for about 8 years, never playing with a toy for all of her 9 years. She has fallen in love with these NTWBs foot toy. 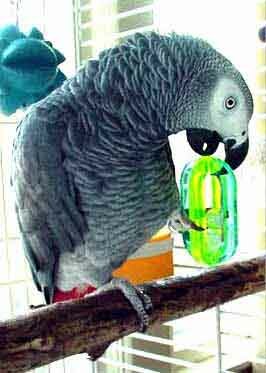 Sidney, Senegal, isn't interested in getting his photo taken, he wants his treats from inside the Maze! 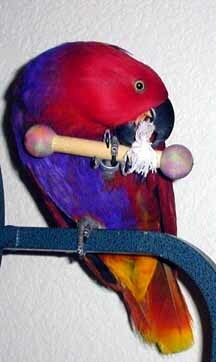 Ruby, SI Eclectus, is just introducing her beak to her first kabob, an overwhelming success! Sir Indigo Blue gives a new definition to tiger in your tank! Indigo lives in Hawaii and owns his very own Doctor! 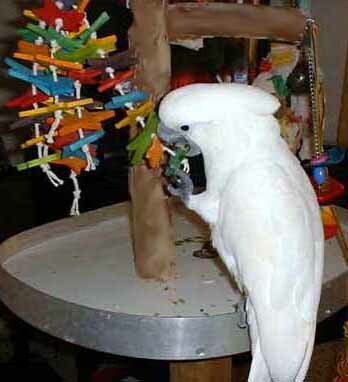 Wolfy lives in Japan with another CAG, Opaa and brown throat conure Choony, is pictured here "working" on his NTWBs! DHYA, La Guera, is taking the first bite out of his Hot Momma! What fun! DHYA, El Guero lives in Mexico with La Guera and their "mum" Monica! The Vine Ring is one of his favorite foot toys! Penelope, U2, is just introducing herself to the Tiger in her cage! BFA Skipper is enjoying her mineral filled bitty bagel!! What a cutie, eh? Ohana is proof that Major Mitchell's are not just beautiful! Acrylics are great fun! 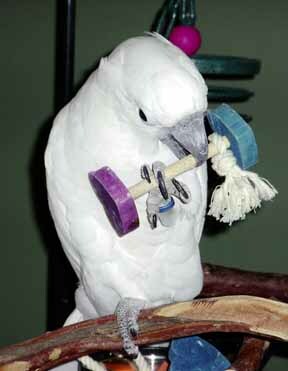 Sam has a ParroTrap in foot and a Southern Cross for his Busy Beak! 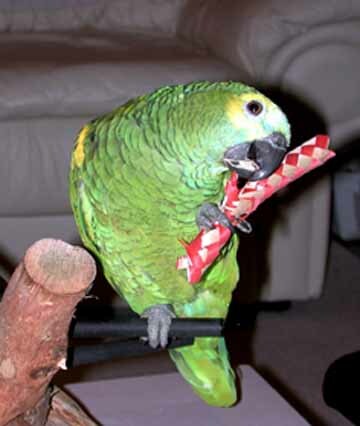 Cape Parrot, Pooh lives in Japan and when her Busy Beaks order arrives-he does his own unpacking! He's helping himself to the tentacle. Aphyna, U2, lives in the Netherlands and was not interested in acrylics until Sunshine & Lollipops ... she LOVES it! Maggie, the Meyers, is enjoying a Busy Beaks Teaser! This Lady Bug doesn't stand a chance with Gabby and clutch-mate #14 each grabbing hold! Ollie, Severe Macaw, loves acrylics! 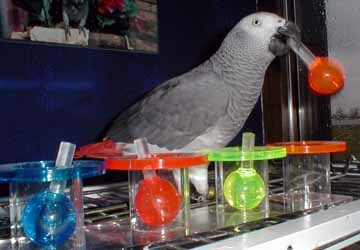 and Lisa hangs his play station on the OUTSIDE of the cage for another play area! BFA, Maggie lives in Canada and loves foot toys! 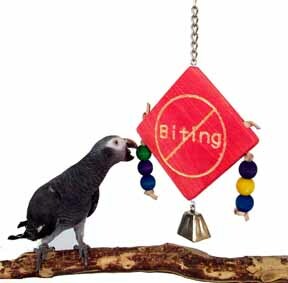 She's enjoying her ParroTrap in this photo! 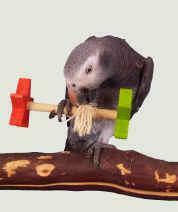 If you'd like for your feathered friend to be included on this page, please take a photograph with one of our toys and submit to us. If we use your photograph, the "model" will receive a free gift in your next order! 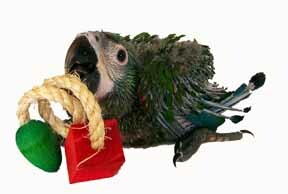 Julie Marie, BFA, has a Southern Cross, and her favorite Busy Bs Foot Toy in her beak! Hedwig, U2, is hanging onto his nut cage while munching on a sisal cholla chew! Gypsy, BFA with the very quiet voice (NOT) loves our Pinatas! It's been one of his favorite toys for years. 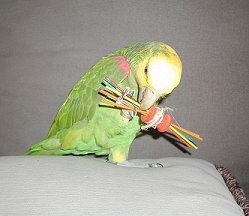 Jessie Claire took this photo of Roca (they live in The Netherlands) demonstrating her talents with the Swizzle Sticks! 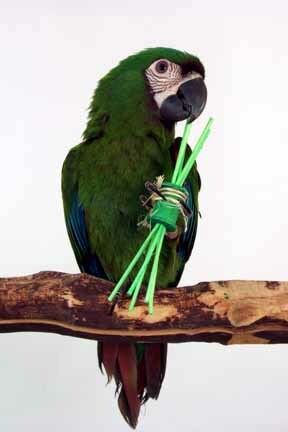 Military Macaw, Clancy, loves everything his beak can destroy. Here he's working on a Lone Star Foot Toy! 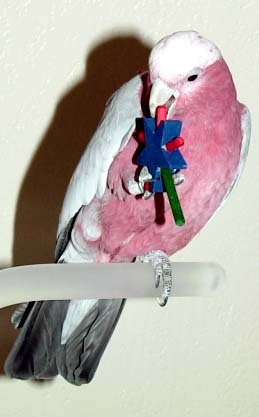 Our Galah, A.J., loves munching on his Starshine Foot Toy! TAG, Demo can't read but seems to know that the "NO BITING" sign is meant for her to chew! 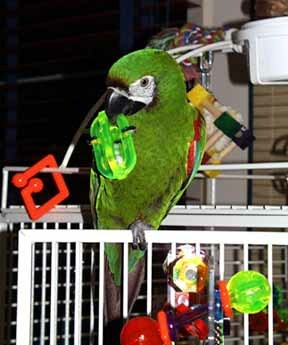 Many Eclectus aren't fond of holding foot toys, Sara Lee proves them wrong! Gabby loves ParroStix almost as much as he loves his mom, Alex! Sydney, GSC2, with the Texas 'too Foot Toy (he helped name because he turned it into toothpicks with such vigor)! Mealy Amazon, Hooter and Severe, Boo Boo working on a twister! 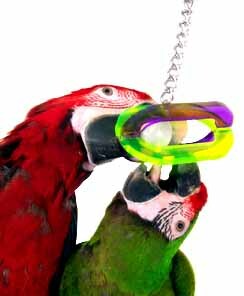 Opaa lives in Japan and is enjoying the Bungee, the Busy Beaks Pinata, a Fiesta Kabob and the remnants of a Clowning Koala! B&G, Big Lou is working on the Double Hearts Foot Toy. 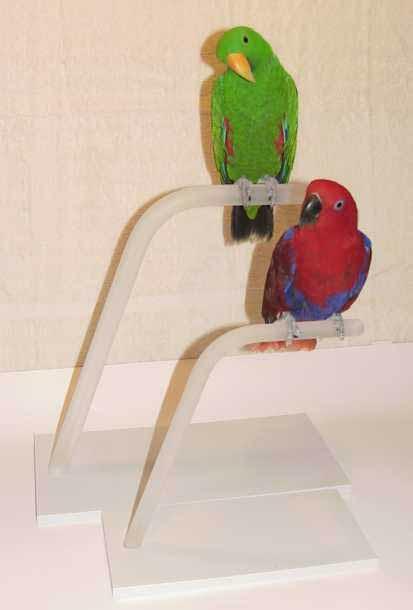 Travis and Shania patiently wait for their showers on our travel perches. Two of the Hooterville Trio investigate a Kokocrunch. 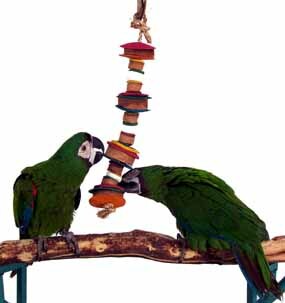 These young Severe macaws belong to Gerry Laga ... of a Feather Aviary in Tucson!! 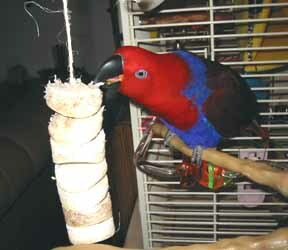 Zachary's Busy Beak is working on a ParroStix Foot Toy! This severe macaw shows it's never too early for a Busy Beaks Teaser! Bubbles, Dr. Kay Duffin's B&G, (Albuquerque, NM) is checking out her B&G Buddy ... nice resemblance, don't you think? CAG, R.T. is "working" on one of the bag of five toys in our acrylic foot toy assortment (medium). Greenwing, LRB and military, Clancy both work on a TARA toy, and thank you for helping us, help TARA! U2, Sydney Jane, is busy working on a Southern Cross! 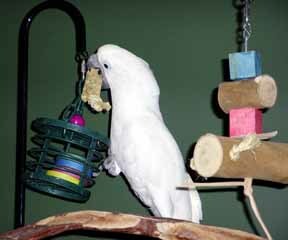 Gandy is on her Swagman ... note her favorite toy, the adding machine paper holder is never far from beak! Tina Timneh is trying to figure out what side is UP with this indestructibell, think she should have started with the small bullet proof bell. 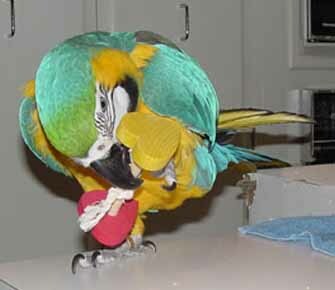 Pigwigeon, U2, is working on a double love (heart) foot toy!